To sew a bag, you definitely need a sewing machine. Unless you're one of those who only hand sews. Well, good luck with that. If you already have access to a sewing machine, use that one and if that one's not good enough for you, consider upgrading after you have sewn a few bags. What makes a good home sewing machine for bag making? First of all, you need to know what you intend to sew. For instance, if you intend to sew with thick heavy fabric most of the time, you'll need a heavy machine with a good, strong motor. Will you be sewing a lot of buttonholes? Then you'll want a one-step buttonhole feature. Before you buy a sewing machine, it's a good idea to check out the internet for reviews. Limit your machines to reputable brands. If possible, test it out first. Try a few models and ask questions. You might be tempted to buy the cheapest sewing machine in the market. Don't. Honestly, you get what you pay for. With a very basic sewing machine, sooner or later you will either struggle with it or start wanting more features. Get the best machine (with the necessary functions) you can afford. There are a few things to look out for when you buy a sewing machine for bag making. You may not necessarily be able to afford all the features I recommend but get as many as possible. a. Drop-in bobbin or front load bobbin. I personally prefer drop-in bobbin. So much easier to use. However, drop-in bobbins are very sensitive. You need to use the correct size bobbin case. I can't for the life of me use my knee to operate the pedal. I think I have two left feet. Try it out before you buy it! A heavier sewing machine is better than one that's easy to carry around. It has to do with the size of the motor. The heavier the machine, the stronger the motor. The stronger the motor, the better it copes with heavier fabric and usage. If portability is more important to you, by all means get a light machine. But know what you are giving up. 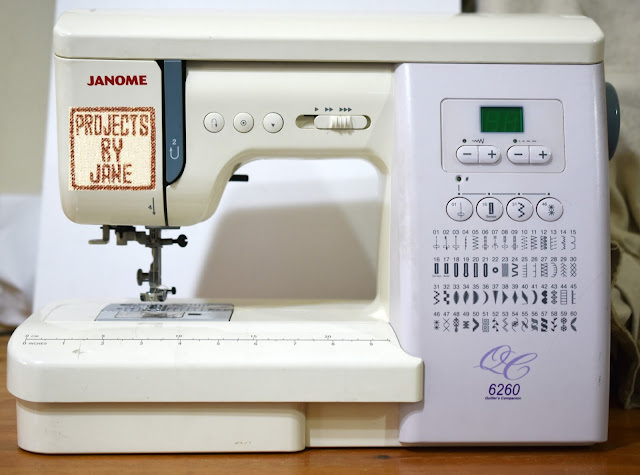 I currently use a Janome 6260QC. What is the most important feature to me? The adjustable needle function. Once I considered buying a mechanical Janome sewing machine which could power through thick fabric easily. However, it did not have the adjustable needle function which I could not live without. This function does not come cheap though! The only thing I don't like about my Janome 6260QC is it is too slow and noisy. It can sew through limited thick layers. I've tried sewing through 2 layers of thick canvas cotton and and 2 layers of cotton and I felt the machine shudder. Medium to thin canvas cotton gave no problems. If you are in the business of sewing super thick fabric, you need to look at specialized machines such as industrial sewing machines which I kid you not are not easy to use. These machines are unlikely to have all the essential features I mentioned above.